Meara's dad made a fruit platter. 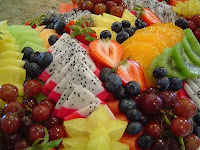 Rows of sliced pineapple lay side by side with cantaloupe, watermelon, strawberries and oranges. Blueberries were sprinkled over the top. Meara's dad had taken great care with the "plate appeal" of his healthy contribution to our wrap party. Nothing else in our banquet came close to the nutritious value of the fruit platter but what the heck, we were ready to party with games and sugar. A library table laden with tortilla chips, salsa, fruit drinks, bags and bags of Doritos and Cheetos and a cake waited for eager fingers. A week before, they had performed "Twelfth Night" four times to acclaim and this would be our final meeting of the year. Sadly, a few of our members missed this celebration. Lyndon also was unable to attend our party. I studied the rehearsal notes in his stage manager binder. Lyndon used lots of exclamation points when he wrote how well an actor handled a speech or, contrarily, how an actor messed up and "NEEDS TO DO BETTER!!!!" Through our four performances Lyndon called the light and sound cues, keeping his crew up to task. When I asked for a timing adjustment on a light cue, Lyndon handled the request with confidence. No family member witnessed Lyndon perform in his role as stage manager. Lyndon, I saw. 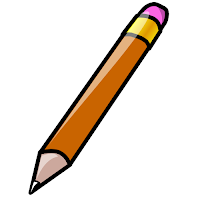 You were professional and adept, and I will miss you. Henry's family swept him off to another neighborhood for the summer before starting up at a new school and he had to miss our party. Henry's Malvolio will never be forgotten. I decided next year's production would be "Macbeth" and used our party to introduce the kids to the basics. 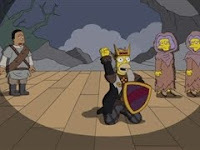 "The Simpsons" has two Macbeth shows. 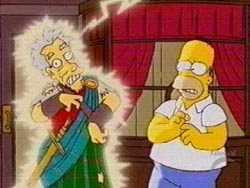 In one episode, Homer plays Macbeth in a Springfield production but is ignored by the critics. Behind the scenes, Marge acts as a Lady Macbeth, urging Homer to kill off his co-stars to be acknowledged in the press. In another episode, the family visits London and runs into Sir Ian McKellen outside of the theatre where he's about to open as Macbeth. 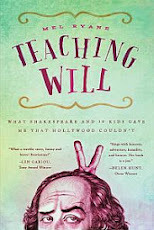 This afforded me an opportunity to explain the "curse" of the play. The entire Simpsons family cannot stop saying "Macbeth." At each utterance, Sir Ian's body is electrocuted by lightning strikes. The kids in The Shakespeare Club love this episode and are fascinated by the idea of the curse. "Look, here's the deal: You cannot say 'Macbeth' backstage or crazy accidents might happen." "Like what could happen, Ms. Ryane...what crazy accidents?" "Well, one time the lead actor broke his leg. Another time a crew guy fell off a ladder." When Calvin yelled, "Macbeth, Macbeth!" I taught them the curse-breaker. "Okay, Calvin, step outside, spin around three times, spit, say a curse word and ask to be invited back in." "Whoa, what curse word, Ms. Ryane?" "All right, I'll give you permission to say 'damn' — but just this time." How many times do you imagine this had to happen? There were seventeen kids at the party. How many times, d'ya think? How many times should I anticipate these hijinks when we actually do "Macbeth"? I'm going to be as fried as Ian McKellen.